As the world shifts to a more environmentally-friendly mindset, it’s important for industries to follow the trend. But sometimes, the idea of going fully sustainable can be expensive: solar technology is still a major investment, wind power might not be enough to completely power office buildings, and recycling on an industrial scale can be difficult to maintain. However, there are small environmentally-friendly steps your office can take that are easy, cost-efficient, and, if maintained, can create a positive impact on the planet. Despite living in the 21st century, many offices still rely on separate phone lines for their internal and external communications. Not only is this inefficient, it also costs more (because of installation, maintenance, and subscription charges), contributes to clutter, and the manufacturing of those extra cables contribute to global warming. However, there is a better way. PBX, or Private Branch Exchange, is basically a private telephone network for businesses. Because it provides companies with different communication channels like Voice Over IP (VoIP) and Integrated Services Digital Network (ISDN), offices can have more phones than then are physical phone lines. Business PBX providers can also give companies the option to avail of other PBX services like voicemail, interactive voice menus (IVRs), call transfers and recording, and many more. A PBX system also allows you to call off-site branches free of charge, regardless if they’re just around the block or in a different country altogether. With PBX, companies lessen their impact on the environment because they use less resources, less energy, and require less material goods to create and maintain an efficient communication infrastructure. You might have seen this sticker on various different appliances and didn’t give it a second thought. But actually, electronics that carry the Energy Star® seal of approval are specifically-designed to save as much energy as possible. Energy Star® is a program launched by the Environmental Protection Agency and the Department of Energy back in 1992 to help curb the country’s negative impact on the planet. Since then, millions of households and commercial buildings have been able to save money on energy costs by using Energy Star® approved products and processes. Despite being highly energy-efficient, products with the Energy Star® sticker don’t differ in price from other brands that don’t have the sticker, making it cost-effective as well. Energy Star® has been instrumental in creating nearly 300,000 jobs in the past 2 years alone, mostly in the manufacture of, and research in, energy-efficient products and materials. In a landmark study conducted by researchers from Harvard University, scientists found that people who work in offices with plenty of natural light were healthier, happier, and more productive than people who worked in conventional offices. Researchers credit this to the fact that sunlight’s full spectrum has positive physical effects on the human body that encourage alertness, concentration, and positive moods. 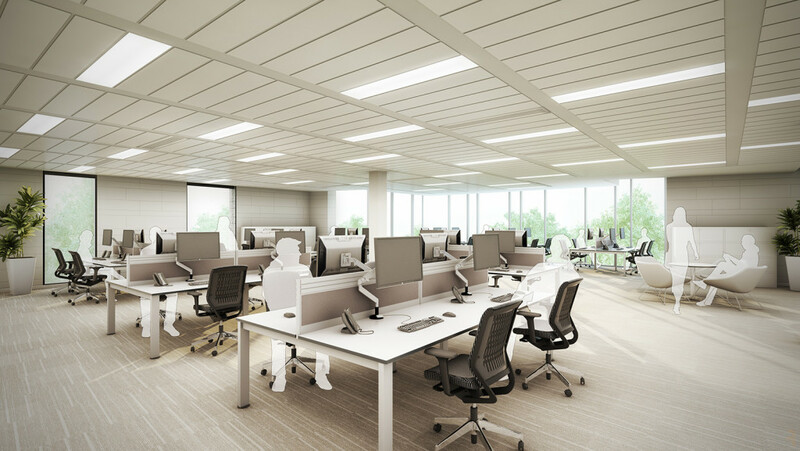 Offices with plenty of natural lighting also see a drastic reduction in their monthly energy usage. Because there’s plenty of light during daytime hours, artificial lights don’t need to be on the whole day. This doesn’t just mean savings, it also means less reliance on traditional, or “dirty”, energy from coal and oil plants. When considering the office interior design, realty experts suggest investing in a space that allows natural light to flow through as much as possible. Open office floor plans are usually optimized for natural lighting, as the arrangement of tables, chairs, and walls are designed to allow as much light as possible. Keep windows clean so that they don’t block light and invest in either lighting control panels or diffuser blinds that help soften sunlight during peak hours. Green walls are walls covered in some form of vegetation. While most usually found in homes, offices are starting to adopt the practice and segregating parts of their office walls for planting greenery. It’s a new trend that many millennials are considering a “must have” for their potential workplace. Usually mounted on specialized trays and grids, green walls can be filled with your choice of plants, flowers, or even herbs. Green walls provide offices with positive visual stimulation; because green is the easiest color for our eyes to process, seeing the color green evokes feelings of calmness, mental healing, and refreshment. Aside from the aesthetic benefit, green walls are also extremely effective at ensuring high indoor air quality. Depending on the plants you put on it, a green wall can be more effective than industrial air filters from keeping toxins and carcinogens out of the air. While it might be tempting to plant flowers for their visual aesthetic, it’s not advisable for an office with people who might have sensitivity to pollen and scents. Instead, consider indoor plants that require little maintenance and can efficiently clean the air in the background. The bigger the company, the more waste it produces. On average, a single office worker produces around 10,000 sheets of waste paper every year and about 2 pounds of mixed paper every day. This isn’t counting waste paper like unused print orders, sanitary paper, old magazines, newspapers, disposable cups, and even sticky notes. One way to reduce paper waste is to go digital. This means migrating all records, invoices, notes, and everything that is written down on paper. Not only will this reduce paper waste, it will also reduce wasted materials like staples, paperclips, folders, clips, and other miscellaneous office supplies. By migrating to a digital library, your office will also free up space; since all records can be kept in relatively small server rooms, the space that rows upon rows of filing cabinet used to occupy can be freed up for other uses. Always choose to invest in green and sustainable technology. If you’re shopping for a new office space, choose one that has access to plenty of lighting, airflow, and far from centers of noise pollution. Invest in alternative energy like solar or wind, and renovate your space to be more open and accessible.